Villette /viːˈlɛt/ is an 1853 novel written by English author Charlotte Brontë. After an unspecified family disaster, the protagonist Lucy Snowe travels from her native England to the fictional French-speaking city of Villette to teach at a girls' school, where she is drawn into adventure and romance. 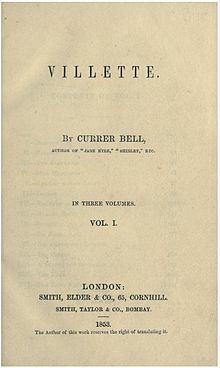 Villette was Charlotte Brontë's third and last novel; it was preceded by The Professor (her posthumously published first novel, of which Villette is a reworking), Jane Eyre, and Shirley. In 1842 Charlotte Brontë, at the age of 26, travelled to Brussels, Belgium, with her sister Emily. There they enrolled in a pensionnat (boarding school) run by M. and Mme. Constantin Héger. In return for board and tuition, Charlotte taught English and Emily taught music. The sisters' time at the pensionnat was cut short when their aunt, Elizabeth Branwell, died in October 1842. Elizabeth had joined the Brontë family to care for their children after the death of Maria Brontë, née Maria Branwell, the mother of the Brontë sisters. Charlotte returned, alone, to Brussels in January 1843 to take up a teaching post at the pensionnat. Her second stay in Brussels was not a happy one. She became lonely and homesick, and fell in love with M. Héger, a married man. She finally returned to her family's rectory in Haworth, England, in January 1844. Charlotte drew on this source material for her first (albeit unsuccessful) novel The Professor. After several publishers had rejected it, Brontë reworked the material and made it the basis of Villette. Most literary historians believe that the character of M. Paul Emanuel is closely based upon that of M. Héger. Furthermore, the character of Graham Bretton is widely acknowledged to have been modelled upon Brontë's publisher, George Murray Smith. The novel is initially set in the English countryside, and later follows Lucy Snowe to the fictional Belgian town of Villette, a Gothic town where the majority of the action takes place. Villette is modelled upon the city of Brussels and is set in the fictional kingdom of Labassecour (modelled on Belgium). "Labassecour" is the French word for farmyard. Lucy Snowe: The narrator and main character of Villette. A quiet, self-reliant, intelligent, 23-year-old woman. Lucy has, as Miss Ginevra Fanshawe asserts, "no attractive accomplishments – no beauty." She seems to have no living relatives. Though usually reserved and emotionally self-controlled, Lucy has strong feelings and affections for those whom she really values. She even sincerely cares for the giddy Ginevra, albeit in a blunt, curmudgeonly fashion. She is a firm Protestant and denounces Roman Catholicism as false ("God is not with Rome"). M. Paul Emanuel: An irascible, autocratic, and male chauvinist professor at Mme. Beck's pensionnat. He is also a relative of Mme. Beck. Lucy relishes his good qualities. He is generous; he delights in giving Lucy secret presents. He is kind and magnanimous, as is shown by his supporting and sheltering the elderly grandmother of his dead fiancée, Justine Marie, together with his former tutor and a servant. He is a Catholic and tries to convert Lucy, a Protestant, to Catholicism but fails. At the end of the novel, it is strongly hinted that he dies in a shipwreck. Dr. John Graham Bretton: A handsome young English gentleman who is a physician. He is the son of Lucy's godmother, Mrs. Bretton. He is described as "cheerful," "benignant," and "bland." Lucy, when young, showed no particular fondness for him. However, when they meet again ten years later, their cool friendship is more than rekindled, and Lucy secretly begins to cherish an affection for him. He does not return this affection, however, and calls her "quiet Lucy Snowe" and "a being inoffensive as a shadow." He has, at first, a passion for Ginevra Fanshawe, which she treats as something that is "for amusement, sometimes." Her love of money and a sneer at Mrs. Bretton quenches his love at last, and he then falls in love with Polly. They eventually marry. Lucy conquers her love for him and buries all his treasured letters to her, saying, "Good-night, Dr. John; you are good, you are beautiful but you are not mine. Good-night, and God bless you!" Mrs. Bretton: Dr. John Graham Bretton's mother and Lucy's godmother. She is a widow and has "health without flaw, and her spirits of that tone and equality which are better than a fortune to the possessor." Polly Home/Countess Paulina Mary de Bassompierre: A 17-year-old English girl who is a cousin of Ginevra Fanshawe. She is first introduced to the story as a very young girl, who is called Polly. As a child, she was very fond of Graham Bretton. She grows to be a beautiful young lady who is delicate and intelligent. Upon meeting Graham again, their friendship develops into love, and they eventually marry. She is somewhat prideful. Lucy says of her, "She looked a mere doll," and describes her as shaped like "a model." She and Lucy are friends. Although Lucy is often pained by Polly's relationship with Graham, she looks upon their happiness without a grudge. Count de Bassompierre: Polly's father, who inherited his noble title within recent years. He is a sensitive and thoughtful Count who loves his daughter. When he notices Polly's relationship with Graham, he is very averse to parting with her. He regards her as a mere child and calls her his "little treasure" or "little Polly." He at last relinquishes Polly to Graham, saying, "May God deal with you as you deal with her!" Ginevra Fanshawe: A beautiful but shallow and vain 18-year-old English girl with a light, careless temperament. She is an incorrigible coquette and has a relish for flirtation. She is a student at Madame Beck's, and it is her passing remark, "I wish you would come to Madame Beck's; she has some marmots you might look after: she wants an English gouvernante, or was wanting one two months ago," which prompts Lucy to go to Villette. Despite Ginevra's faults, Lucy cherishes a certain fondness for her. Ginevra thinks of Lucy as "caustic, ironic, and cynical," calling her "old lady," "dear crosspatch," and most frequently "Timon" (after a Greek misanthrope who lived during the 5th century BC). She eventually elopes with a man named Count Alfred de Hamal and keeps in touch with Lucy via letters. Madame Beck: The owner and headmistress of the boarding school for girls where Lucy is employed. She is short and stout, but not uncomely. Her complexion is fresh and sanguine, with the colour, but not the texture, of youth. Her eyes are blue and serene; "She looked well, though a little bourgeois … ." She has good sense and is an excellent administrator. Lucy says, "[S]he had no heart to be touched: it reminded her where she was impotent and dead." Lucy further describes her as "wise, firm, faithless; secret, crafty, passionless; watchful and inscrutable; acute and insensate — withal perfectly decorous — what more could be desired?" She seems to have an attraction to Graham at first, but that dies away quickly and she then seeks to marry M. Paul Emanuel. She does all she can to keep Lucy and Paul apart. Rosine: The pretty but unprincipled portress at Madame Beck's boarding school. She is "smart, trim, and pert" and "not a bad sort of person," according to Lucy. She likes to be bribed. Villette begins with its famously passive protagonist, Lucy Snowe, age 14, staying at the home of her godmother Mrs. Bretton in "the clean and ancient town of Bretton", in England. Also in residence are Mrs. Bretton's son, John Graham Bretton (whom the family calls Graham), and a young visitor, Paulina Home (who is called Polly). Polly is a peculiar little girl who soon develops a deep devotion to Graham, who showers her with attention. But Polly's visit is cut short when her father writes to summon her to live with him abroad. For reasons that are not stated, Lucy leaves Mrs. Bretton's home a few weeks after Polly's departure. Some years pass, during which an unspecified family tragedy leaves Lucy without family, home, or means. After some initial hesitation, she is hired as a caregiver by Miss Marchmont, a rheumatic crippled woman. Lucy is soon accustomed to her work and has begun to feel content with her quiet lifestyle. During an evening of dramatic weather changes, Miss Marchmont regains all her energy and feels young again. She shares with Lucy her sad love story of 30 years previously, and concludes that she should treat Lucy better and be a better person. She believes that death will reunite her with her dead lover. The next morning, Lucy finds Miss Marchmont dead. Lucy then leaves the English countryside and goes to London. At the age of 23, she boards a ship for Labassecour (Belgium) despite knowing very little French. She travels to the city of Villette, where she finds employment as a bonne (nanny) at Mme. Beck's boarding school for girls. (This school is seen as being based upon the Hégers' Brussels pensionnat). After a time, she is hired to teach English at the school, in addition to having to mind Mme. Beck's three children. She thrives despite Mme. Beck's constant surveillance of the staff and students. "Dr. John," a handsome English doctor, frequently visits the school because of his love for the coquette Ginevra Fanshawe. In one of Villette's famous plot twists, "Dr. John" is later revealed to be John Graham Bretton, a fact that Lucy has known but has deliberately concealed from the reader. After Dr. John (i.e., Graham) discovers Ginevra's unworthiness, he turns his attention to Lucy, and they become close friends. She values this friendship highly despite her usual emotional reserve. We meet Polly (Paulina Home) again at this point; her father has inherited the title "de Bassompierre" and is now a Count. Thus her name is now Paulina Home de Bassompierre. Polly and Graham soon discover that they knew each other in the past and renew their friendship. They fall in love and eventually marry. Lucy becomes progressively closer to a colleague, the irascible, autocratic, and male chauvinist professor, M. Paul Emanuel, a relative of Mme. Beck. Lucy and Paul eventually fall in love. However, a group of conspiring antagonists, including Mme. Beck, the priest Père Silas, and the relatives of M. Paul's long-dead fiancée, work to keep the two apart, on the grounds that a union between a catholic and a protestant is impossible. They finally succeed in forcing M. Paul's departure for the West Indies to oversee a plantation there. He nonetheless declares his love for Lucy before his departure and arranges for her to live independently as the headmistress of her own day school, which she later expands into a pensionnat (boarding school). During the course of the novel, Lucy has three encounters with the figure of a nun — which may be the ghost of a nun who was buried alive on the school's grounds as punishment for breaking her vow of chastity. In a highly symbolic scene near the end of the novel, she discovers the "nun's" habit in her bed and destroys it. She later finds out that it was a disguise worn by Ginevra's amour, Alfred de Hamal. The episodes with the nun no doubt contributed substantially to the novel's reputation as a gothic novel. Villette's final pages are ambiguous. Although Lucy says that she wants to leave the reader free to imagine a happy ending, she hints strongly that M. Paul's ship was destroyed by a storm during his return journey from the West Indies. She says that, "M. Emanuel was away three years. Reader, they were the three happiest years of my life." This passage suggests that he was drowned by the "destroying angel of tempest." Brontë described the ambiguity of the ending as a "little puzzle" (quoted in Chapter XII of Gaskell's Life). Villette is noted not so much for its plot as for its acute tracing of Lucy's psychology. The novel, in a gothic setting, simultaneously explores themes of isolation, doubling, displacement and subversion, and each of their impacts upon the protagonist's psyche. Villette is sometimes celebrated as an exploration of gender roles and repression. In The Madwoman in the Attic, critics Sandra Gilbert and Susan Gubar have argued that the character of Lucy Snowe is based in part on William Wordsworth's Lucy poems. Gilbert and Gubar emphasise the idea of feminine re-writing. Some critics have explored the issues of Lucy's psychological state in terms of what they call "patriarchal constructs" which form her cultural context. Villette also explores isolation and cross-cultural conflict in Lucy's attempts to master the French language, as well as conflicts between her English Protestantism and Catholicism. Her denunciation of Catholicism is unsparing: e.g. "God is not with Rome." The Daily Telegraph's, Lucy Hughes-Hallett argues that Villette is greater than Brontë's most famous work Jane Eyre. She states that the novel is "an astonishing piece of writing, a book in which phantasmagorical set pieces alternate with passages of minute psychological exploration, and in which Brontë’s marvellously flexible prose veers between sardonic wit and stream-of-consciousness, in which the syntax bends and flows and threatens to dissolve completely in the heat of madness, drug-induced hallucination and desperate desire.". Jamaica Kincaid's novel Lucy (1990) draws numerous themes, character names, and plot elements from Villette, both echoing its concern of female repression while also offering an implicit postcolonial critique of the novel's slave-owning love interest. In 1970, the BBC produced a television miniseries based on Villette, directed by Moira Armstrong and written by Lennox Phillips. It starred Judy Parfitt as Lucy Snowe, Bryan Marshall as Dr. John Graham Bretton, Peter Jeffrey as Paul Emanuel, and Mona Bruce as Mme. Beck. In 1999, the novel was adapted as a three-hour radio serial for BBC Radio 4. It was broadcast in February 1999 with Catherine McCormack as Lucy Snowe, Joseph Fiennes as Dr. Graham Bretton, Harriet Walter as Mme. Beck, James Laurenson as M. Paul Emanuel, and Keira Knightley as Polly. It was directed by Catherine Bailey and written by James Friel. Villette went on to win a Sony Award. In August 2009, the novel was adapted as a two-week-long serial by Rachel Joyce for BBC Radio 4, directed by Tracey Neale and with Anna Maxwell Martin as Lucy Snowe. ^ Wein, Toni (1 January 1999). "Gothic Desire in Charlotte Bronte's Villette". SEL: Studies in English Literature 1500–1900. 39 (4): 733–746. doi:10.1353/sel.1999.0040. ISSN 1522-9270. ^ Machuca, Daniela, "My own still shadow-world" : melancholy and feminine intermediacy in Charlotte Brontë's Villette, eCommons@USASK . ^ "Charlotte Brontë: Why Villette is better than Jane Eyre". Telegraph.co.uk. Retrieved 3 February 2016. ^ "Why 'Jane Eyre' Is Totally Overrated". The Huffington Post. Retrieved 3 February 2016. ^ Yost, David. "A Tale of Three Lucys." MELUS 31.2 (2006).